Sathorn Sunset (2018) is a project consisting of photography and films that focus on Bangkok’s Sathorn district—a major commercial area that includes multiple skyscrapers, high-rise condominiums and office buildings. The tower was designed by architect turned real estate developer Rangsan Torsuwan. The tower makes use of imposing Classical architectural elements, particularly Classical Order columns usually found in Greek and Roman architecture. The classical order columns facades are peppered generously on every floor and balcony of this 185m high building. Sathorn Unique Tower reflects the exuberant style which was in vogue during the economic wave of the early 90s. Rangsan Torsuwan is generally credited as an architect who popularised this particular architectural fad of Classical Order columns in Thailand during the 1990s. 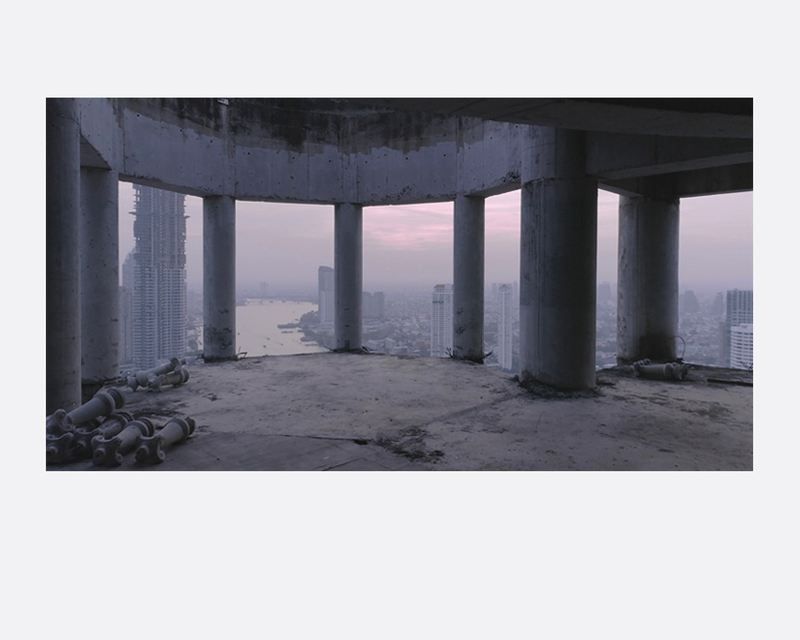 Sathorn Sunset is part of Dream Property (2014-ongoing) a project that examines the nature of property development and its relationship to the city through various method including photography, film, text appropriation and site specific installation. Miti Ruangkritya (b.1981, Thailand) is a Thai-based photographer and visual artist. Miti was selected Winner by the Magenta Foundation for Emerging Photographers (UK) in 2011. He was featured as an emerging artist at Bangkok University Gallery in 2014. Additionally he was shortlisted for Kassel Book Award in 2015 and nominated for Prix Pictet in 2015-16. In 2016 he was selected as one of the finalists of the Sovereign Asian Art Prize. Exhibitions in 2017 include Shaping Voices, Silent Skies (Tomio Koyama/8, Tokyo) and After Utopia: Revisiting the Ideal in Asian Contemporary Art (Samstag Museum, Australia). In 2018 his exhibition includes Sathorn Sunset (WTF, Bangkok) as part of exposing up and coming artists project by the Art Centre of Silpakorn University. He is currently working on a book for onestar press (France).